We are pleased to present our coverage of Gallic Warriors at the Battle of Alesia! Caesar's campaign in Gaul lasted from 58-50 B.C. when the Gallic Tribes, united under their King Vercingetorix, were decisively defeated at the Battle of Alesia. The figures presented here can represent any of the various Gallic Tribes such as the Suebi, Belgae, Nervii, etc... and are the perfect complement to our Caesarian Romans. 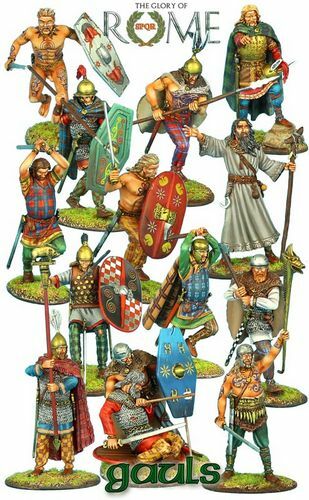 Ferociously presented in their intricate patterns and war paint, these figures are certainly some of the finest we've produced and will make any excellent addition to any serious Roman toy soldier collection.